In offset printing, a minimum number of copies should be bought because there is always waste (inserter), with digital printing the first copy salable, and one buy just 1 copy. In the offset process one can choose a large number of papertypes, with digital printing one should use laser paper. In the offset printing proces one can choose between printing in 1 or 2 or 4 or 5 or 6, 8, 10 upto 12 colors. In digital printing one is limited in the choice between black and white or 4-color printing. After the offset printing cycle, the leaves have to dry before he finishing process can start, paper printed digitally is directly ready to be delivered. Digital printing is a one-day process, offset printing take several days to complete the process. 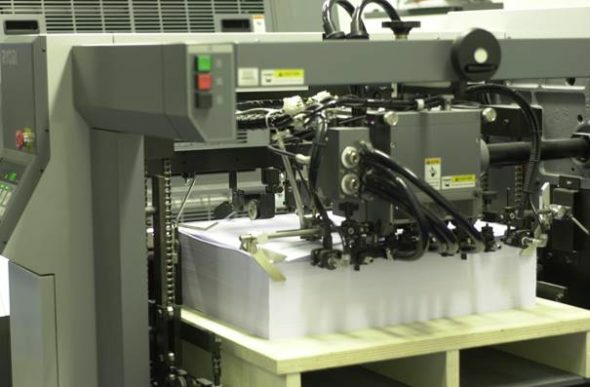 In the offset printing process we work serially, this means that after the printing of all sheets, they need to be collected into the final book version. In the digital printing process we work in parallel … the paper coming out of the digital printer is already collected and ready for to place of a binding, or better yet, the process of bookletting is done ​​directly in the printer. Offset printing has always an initial cost, digital printing has not, here we pay-per-printed copy. The offset quality is different than the digital quality. If you would like to see and feel the difference, you can always have a look into one of our stores.